Indian head massage is a tradition that has been practiced in India for over 1000 years, it is based on the ancient Ayurvedic healing system. Indian head massage concentrates massage to the head, scalp, upper back, shoulders, neck, upper arms and face. These areas incorporate important energy centres within your body. Treating these zones is very beneficial for your whole body and mind, boosting both your physical and emotional health. This relaxing and calming therapy can be performed in a laying or seated position. 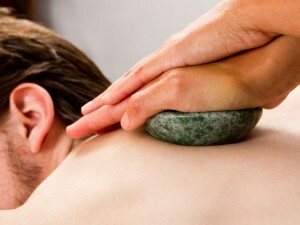 Your therapist will use a variety of techniques, massage pressures and rhythms to stimulate and manipulate muscles and soft tissue within the areas. At Zensations you can expect to receive an exquisite sensory experience. Indian head massage creates deep relaxation to induce a state of calm, peace, tranquility and a feeling of well-being. It is an excellent treatment for all types of stress-related problems. It disperses toxins from tense, knotted muscles, improves circulation and lymphatic drainage, relieves eyestrain and tension headaches, provides relief from aches and pains, promotes a healthy scalp and hair, is excellent for improving disturbed sleep and insomnia, aids mental tiredness and tension, improves concentration and relieves mental and emotional stress. Induces total relaxation, gives a feeling of well-being and calm. Triggers the release of endorphins (feel good chemicals in your brain) creating a feeling of contentment and happiness. The deep state of relaxation relieves all types of stress-related problems, improves breathing, lowers blood cholesterol, aids hormonal balance and increases immunity. The increased blood circulation to the brain helps beat mental fatigue and aids concentration. Relieves stiffness in the neck and shoulders. Relieves eyestrain and tension headaches. Breaks down knots which develop from tension within the muscles. Helps get rid of waste and toxins, which aids detoxification of the body. Brings oxygen and nutrients to the head, neck and shoulders, helping to improve skin condition and stimulate hair growth.